Michigan arguably has had some of the best summer weather in the U.S. this year. The last week of July was the closest we came to hot weather. It reminded me of the so-called "Dog Days of Summer." 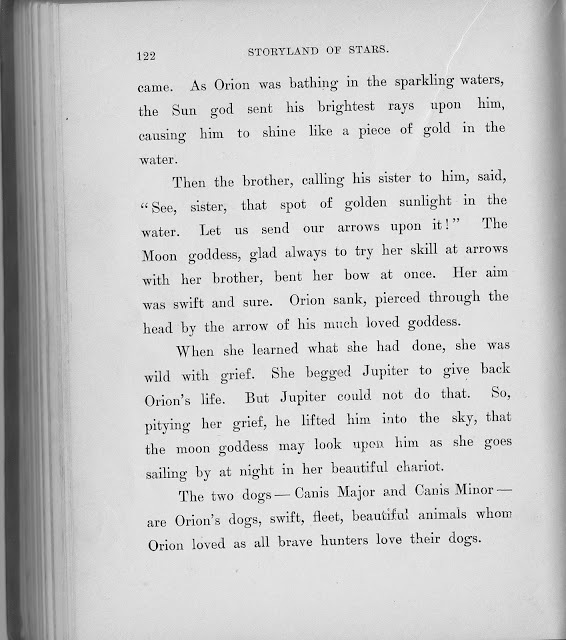 from Steve Dale's Pet World "Summer dog photo contest"
That mention of Sirius, the Dog Star, brings us to the story of Orion, his master. 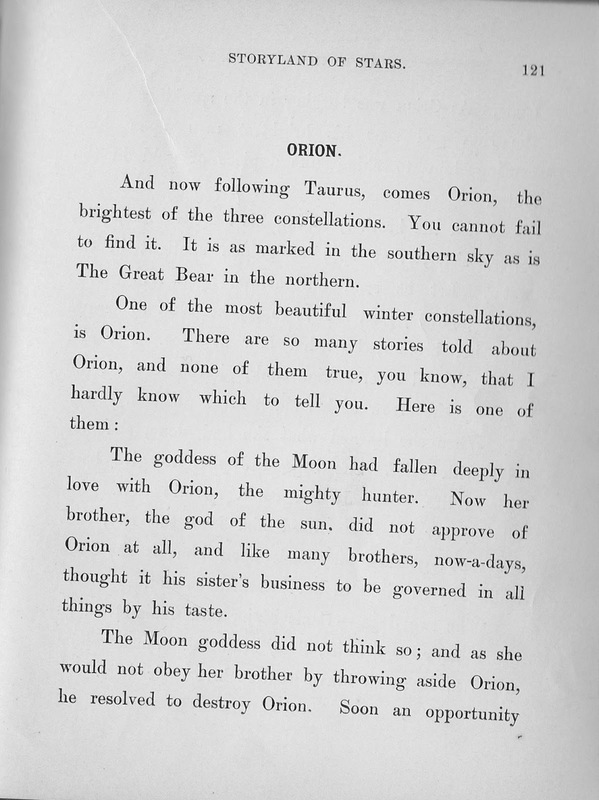 The basics of that story are nicely told by Mara L. Pratt in her 1892 book The Storyland of Stars. 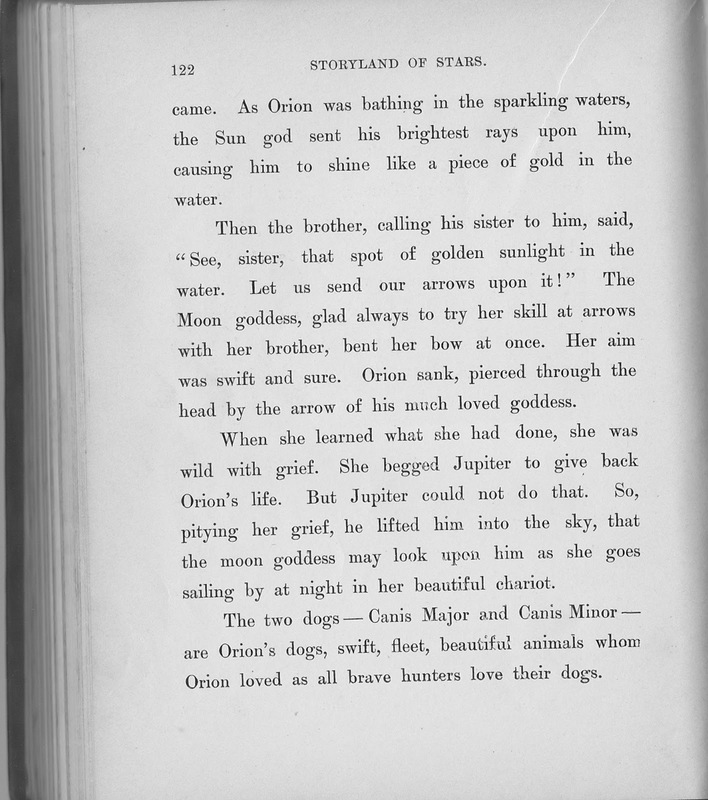 If you have an interest in stories related to the constellations or about such astronomical topics as shooting stars or comets, don't let the 1892 copyright scare you off some delightful material. Orion was madly in love with the daughter of King Oenopion of Chios, Metrope, but was never allowed to marry her. One day, while drunk, he did something horrible to Metrope, and her father asked Dionysis to curse him. Dionysis put him into a coma and then blinded him. When he awoke, he went to an Oracle, who told him he would get his sight back if he traveled east and let the rays of the sun strike his eyes. Orion did so, and after regaining his sight he moved to Crete. In Crete, the goddess of the moon, Artemis, fell in love with him, and was too distracted to remember to light up the sky with moonlight. That boy was made for the modern day media, wasn't he? I greatly enjoy the storytelling of Barbara McBride-Smith and one of her specialties is bringing Greek myths alive as if they were a bunch of Good Ol' Boys in Texas. It reminds me of when I still worked at Mount Clemens Public Library. Annually the middle schoolers would come in talking about mythology as if it was the latest soap opera. Jean Fargo, I never sat in your classroom, but it must have approached the level of Barbara McBride-Smith, who combines her professional storytelling with her "day job" as a school librarian. If you can't enroll in Mrs. Fargo's class, I recommend two of McBride-Smith's award winning CDs, It's Not Easy Being a Goddess and Good Old Boys And The Women Who Love Them. The latter includes Eve and Mrs. Noah as well as Greek myths. Here's the 2015 astronomical look at Orion the Hunter and Sirius the Dog Star from EarthSky, the daily astronomical newsletter. As they point out, "Every year in late August, look for Orion the Hunter and Sirius the Dog in the early morning sky! Orion’s three prominent Belt stars always point to Sirius." Here's also a short video of Weather Wisdom: The Dog Days of Summer from The Old Farmer's Almanac which mentions on their current homepage that this month will have the best meteors in years, so maybe I'll next bring Pratt's commentary on Shooting Stars. I have many nature programs including one on astronomy, but Orion and faithful Sirius is a story suited to an older audience than the general family setting for most nature programs. It is, however, a story worth Keeping the Public in Public Domain.